If you are considering buying a swing set, one of the things you need to consider is the material. There are basically two types of materials used in making a swing set. These are wood and metal. The best metal swing sets come with several advantages as they are sturdier and long lasting. They are not affected by adverse weather conditions such as rain and snow. However, with the wide range of options available, it can be a bit difficult choosing the best metal swing set. The good news is that we have got you covered. We will show you how to choose the right one. We will also review the various brands available on the market to help you make a wise buying decision. Why you need a metal swing set? How metal swings sets work? How to choose the best metal swing set? You cannot deny the fact that swing sets have been a favorite for many kids since time immemorial. They make it possible for children to exercise on a daily basis while having fun. No matter our age, we all remember playing with our friends at the swing set. One of the benefits of the swing sets is that they are usually cost effective as they offer more playing stations at a fair price. Low maintenance cost. It is easy to take care of the metal play sets as compared to other materials. Metal swings don’t require regular repairs such as sealing, painting or finishing. While they may need to be periodically checked for rust or other occasional touch-ups, the metal playset doesn’t require a lot of maintenance. Easy to assemble. The swings sets that are made of metal are relatively easy to assemble for several reasons. Metal doesn’t wrap and this means everything will fit well. Pieces made of metal are also lighter and easy to maneuver. This means you do not need to mid about lifting weights for the purpose of bulking up before assembling the swing set. The metal swing is a structure that is synonymous with many playgrounds around the world to the point where no playground looks complete without them. Not only are they sturdy and affordable but they can be a source of fun for all age groups. When people talk of the best heavy-duty swing sets metal today, what they have in mind is a classic model that has 4 legs and a rail on top. However, even though many of the metal swings have a similar design and plan, there is a wide variety of the best swing set for the money available. 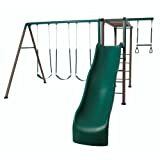 These can range from the basic models that have no adornments to the extravagant metal swing designs that have slide attachments and monkey bars. The wide variety of these designs makes it possible for customers to find the right swing set for the user even though there are some designs that are specifically made for children (like those with monkey bars and attachments for sliding). While these are much rare, there are metal swing sets for adults that are designed to move faster and are usually higher than those made for children. The wide variety of designs makes it possible for customers to find a swing set that will be suited for the user. Size of your garden. You will want to avoid buying a swing set that will take up the entire space in your yard. You can start by measuring the length and width of the swing set and then the space needed around it. Swing set’s ground cover. If your child falls, this can prove to be potentially dangerous. This is why you need to consider the type of soil. Avoid hard surfaces such as pavement cement, cobblestones, and tiles. After doing thorough research, we have been able to create this list of the top 7 picks of the best metal swings set. This is a swing set that is suited for kids aged between 3 and 12 years. It has been designed with safety in mind and comes with rounded edges and plastic caps to keep your child safe as they play on it. Since the metal swing set for the garden is free-standing, it does not require anchoring or cementing. Unlike wood that is subject to rotting, warping or peeling, this playset is constructed using a strong but low-alloy steel that enables it to last longer. This is a metal swing set that is suitable for children aged 2 to 10 years. It can accommodate up to 9 kids as long as the weight restriction is adhered to. It has a weight restriction of 105 pounds per set and a maximum of 945 pounds. Some of the key features of the equipment include 2 kid comfort swing set, an easy grip trapeze swing, seesaw, air glider, and 6 slides. This swing set has been constructed to be safe, weather resistant and almost free of any form of maintenance. You can even install it on uneven ground. The swing set is really tall and your kids will love it. If you are searching for a heavy-duty swing sets metal that will offer unlimited fun to your kids, this is just but the right option for you. This is among the best swing set for the money as it offers the real playground experience at the privacy of your back yard. It consists of a 6 wave slide, 2 sling-swings, trapeze, passenger air glider, and lawn swing. This playset strong enough for adults is a great choice for big families as it can accommodate up to 10 kids. It has adjustable swing chains and this makes it suitable for children of different age groups. It is backed by a manufacturer warranty of 180 days. All the parts of the playset are painted and it has HDPE parts that ensure protection against UV rays. This is another metal swing set for adults and children that will keep your kids busy all day long. It comes with 2 swing seats, a slide that can accommodate up to 4 children and trapeze. It has some adjustable twirl and swing on a trapeze that enables for more active play. It comes with safety features that surpass ASTM safety standards. To ensure optimum performance, the swing chains can be adjusted. 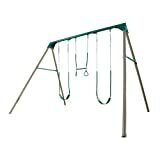 This is among the heavy-duty swing sets metal that is suitable for backyards of medium to large sizes. The trapeze has twirl and swing to ensure your kids remain active all day long. This is another metal swing set that will keep your children active all day long no matter their age as it has been designed for children of different ages. Some of its key features include 3 belt swings, a wavy slide of 9”, monkey bar, fireman pole and a trapeze bar consisting of gym rings. It has been created with safety in mind and has all rounded hard edges, soft rubber grips and plastic caps for extra safety. The fact that it is free standing means you do not need to cement the playset and it is also easy to maintain. The play set has been made with strong but low alloy steel that is suitable for all weather. This means it doesn’t chip, warp, fade or peel. As a sign of its superior construction, it is also backed by a manufacturer warranty of 5 years. This is quick to assemble gym set that comes with a wide range of features like a trapeze swing, air glider, 2 passenger seesaw seats, wave slide, and molded super fun swings. It is suitable for kids aged between 2 and 10 years and can accommodate a maximum of 10 kids as long as long as the weight restriction is adhered to. The swing set has a frame painted with a powder coat to ensure stability and strength. While it is relatively easy to assemble, it requires adult assembly. If you are searching for one of the heavy-duty swing sets for adult, this may be the right choice as it has a weight restriction of 105 pounds per seat. It comes with a guarantee of 180 days. This metal swing set for the garden has 6 play stations that make it possible for 8 kids to play at the same time. It is recommended for kids aged between 3 and 8 years. Some of the features we liked in it include 2 swings, a Stan n Swing, see-saw, metal glider, handrails, foam leg guards that ensure extra security, one piece slide that is blow molded to ensure ease of assembly and a safe swing set. It has a safe-touch PVC chain cover on the swing seats that are blow molded to ensure no pinch happens. The metal glider has a capacity of 2 riders. The steel frames have been welded without any bolts corners to ensure easy assembly and greater stability. There are handrails on the wave slides as well as a stop landing that is meant to ensure a safe landing. If you are thinking of purchasing a playset, you will definitely excite your kids. However, you need to be careful as not all materials are created equal. While the playset may look great when new, these may not hold up over a period of time. Not only can they splinter but they can also result in other safety hazards. On the other hand, the metal play sets guarantee safety, stability, and durability. But one thing you need to realize is that there are some good metallic swing sets as well as some bad ones. By going through this guide, it will be possible to make a wise buying decision when searching for the best swing set.